DesktopEyes is a small application, in fact extremely small, which functions as nothing more than a novelty for your Windows desktop. 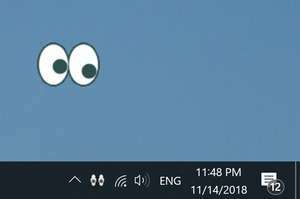 In short, they are two googling eyes which follow you around on the desktop. Though small, there are a couple of configuration options for this little toy such as transparency, mouse fad, click-through and an about box. You may also add multiple eyes of different sizes to your desktop. For security reasons, you should also check out the Desktop Eyes download at LO4D.com which includes virus and malware tests. Additional screenshots of this application download may be available, too.